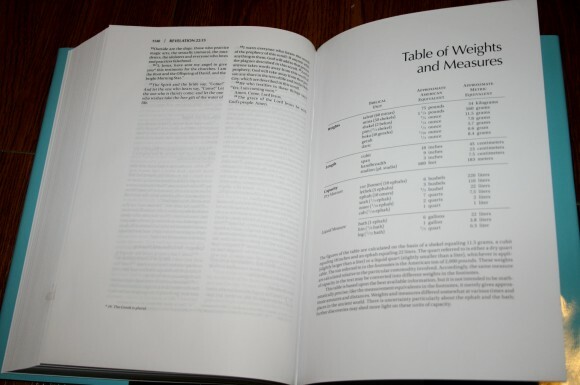 It’s no secret that I’m a fan of wide margin Bibles. They promote Bible study and having your own notes is better than having someone else’s commentary. 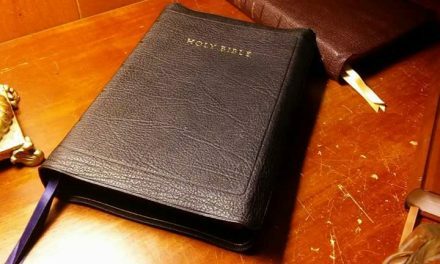 They also (hopefully) have better paper and print than the regular everyday Bible. 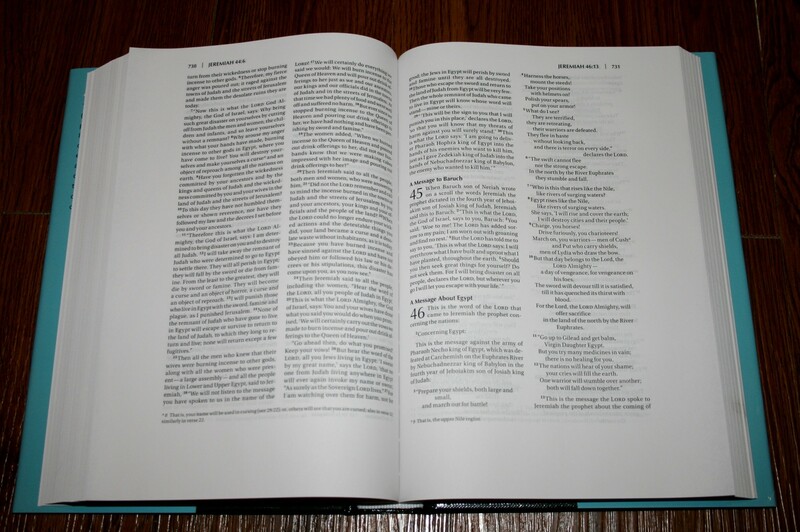 One such Bible is the new NIV Note-Taker’s Bible from Zondervan. The edition I’m reviewing is hard cover. 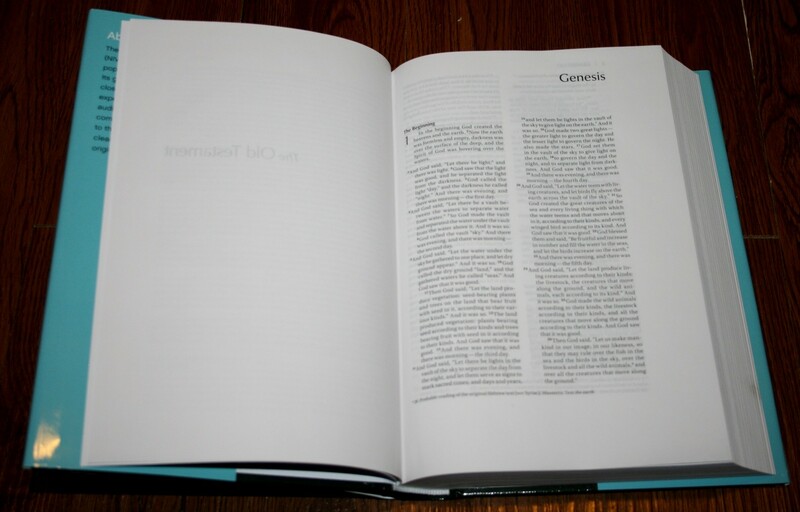 It comes with a removable cover. The cover underneath is a solid dark blue (the same dark blue on the removable cover. 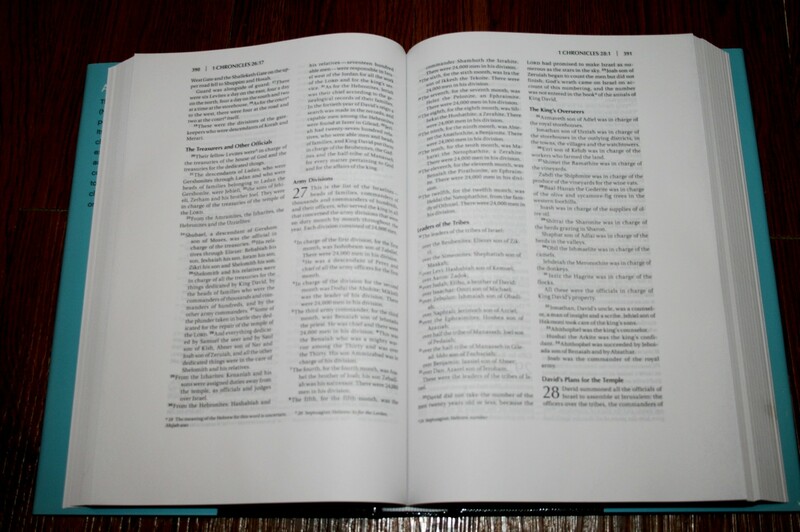 The binding is glued in sections. It has no trouble lying flat. I love the size of this Bible. It fits in the hand nicely and is good for carrying. It’s not small, but it’s not large either. The paper and print are amazing. 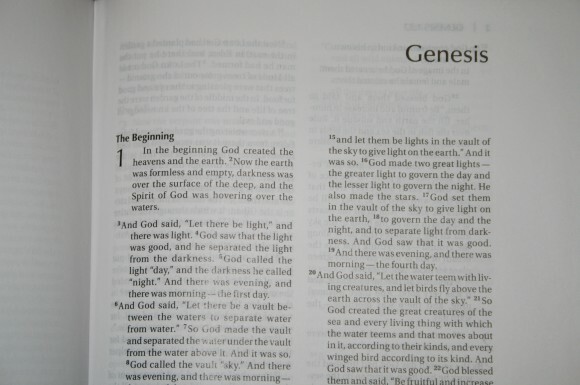 It’s more like a regular book than a Bible. The paper is thick for writing and has a high degree of opacity. It’s more opaque than what you see in my photos. 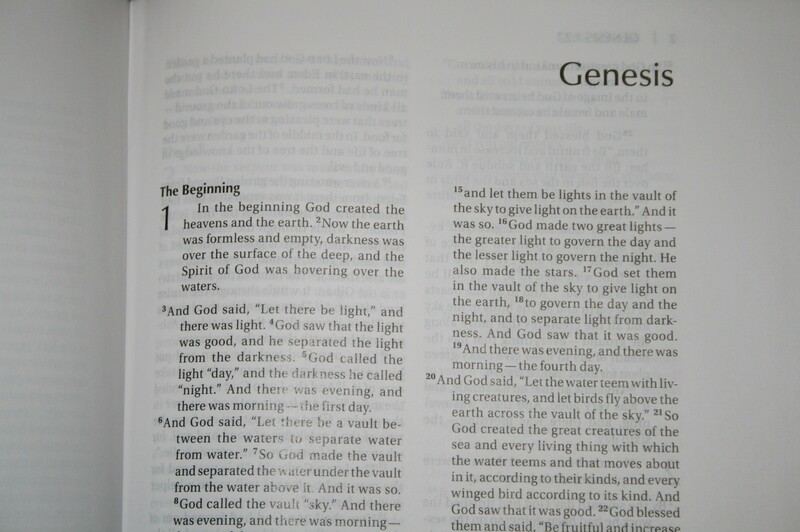 It’s among my favorite paper in a Bible. The print is very nice. It looks like an 8-point font with a 9-point leading (but I’m guessing). It is very consistent throughout. It looks semi-bold. It’s very clean and sharp. It makes a great reading Bible. A few writing pages in the back would have been nice. 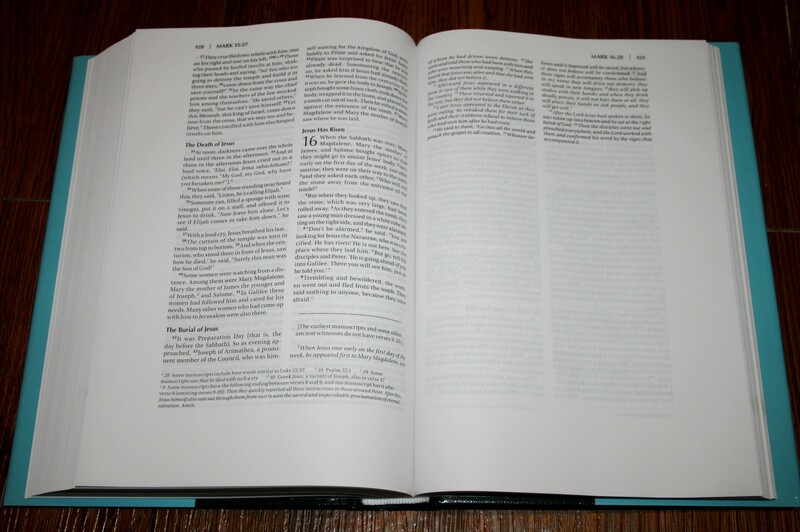 The text is presented in 2-column, paragraph format. 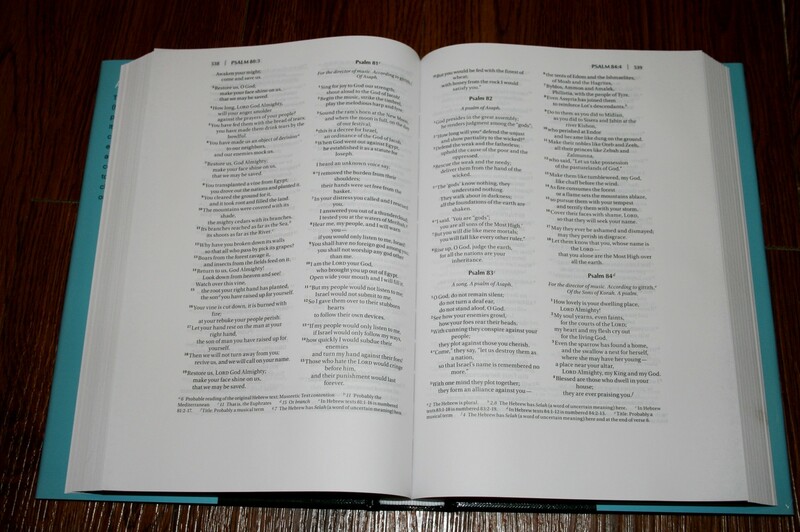 Old Testament quotes are in oblique text and poetry is set to verse. 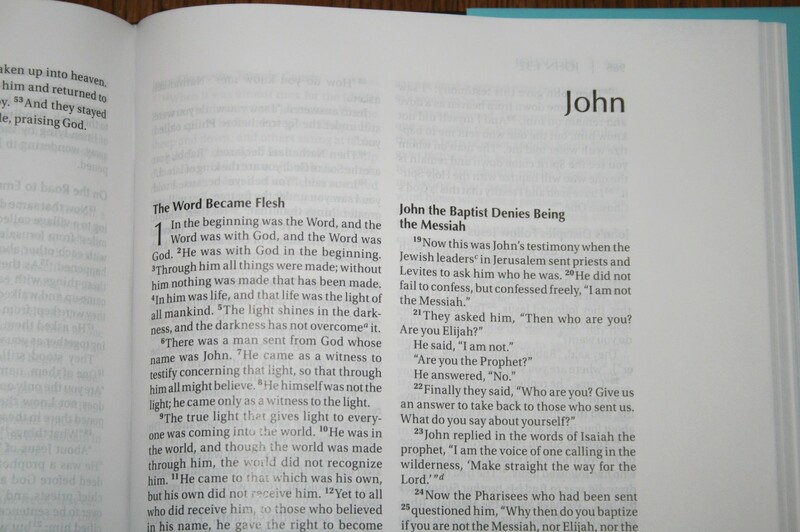 The top of the page shows the first verse that appears on the left page and the last verse that appears on the right page, along with page numbers. 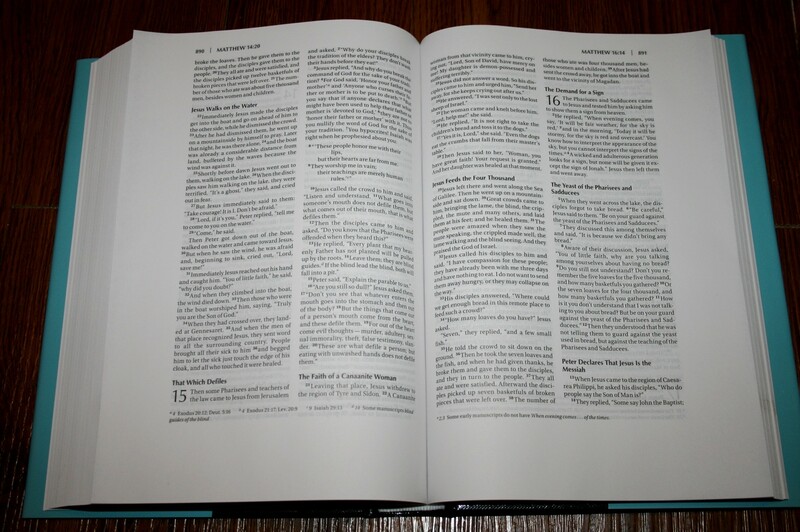 Verse numbers seem to be the same boldness as the text, but to me they are easier to find than many Bibles in paragraph format. There are 1.5 inch wide margins on the outside margin and a 1 3/8 inch margin at the bottom of the page. There is no inner margin, so there is no writing space devoted to the inner column. 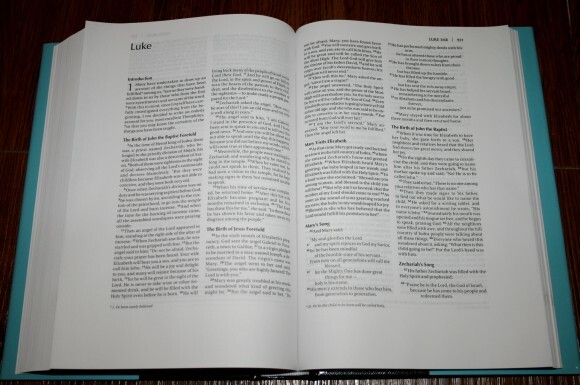 This is my one complaint, though having wide margins in the inner column are difficult to use and would have made the Bible wider. 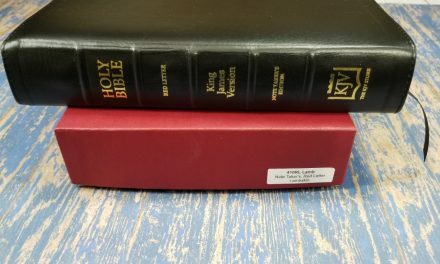 I love the overall size and the margins might be large enough (depending on the kind of notes you want to take), so my complaint is really minor. Section headings are bold. They stand out nicely and there are lots of them. 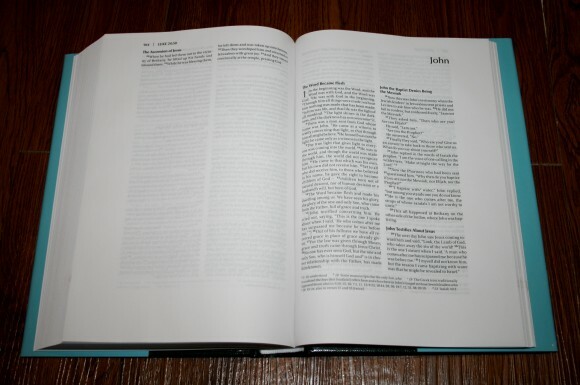 They separate the text well and help in finding what you’re looking for. Translation notes appear at the bottom of the page. They are keyed to the text with letters. Books start on a new page. This leaves room at the end of most books for notes. This is something that all Bibles should do in my opinion. 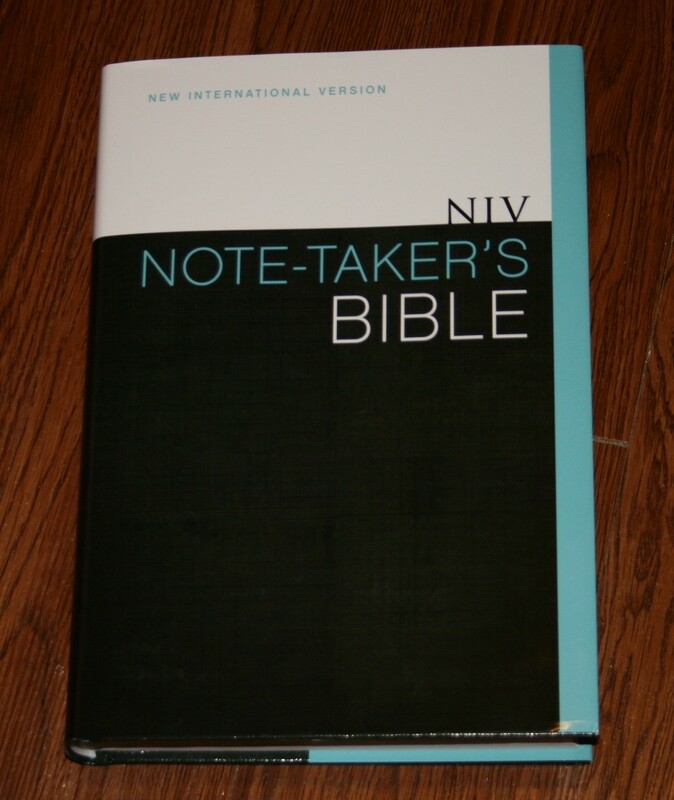 The NIV Note-Taker’s Bible is a great edition of the NIV for taking notes, writing your thoughts, journaling, witnessing, teaching, personal study, etc. The paper and print are nice, and the text is free from distractions. 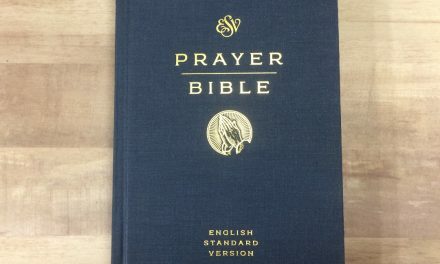 It also makes a great reading Bible. 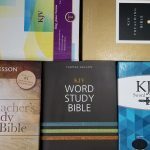 I recommend it even if you just want a nice Bible to read without breaking the bank. Hi Emily. Thanks for stopping by. 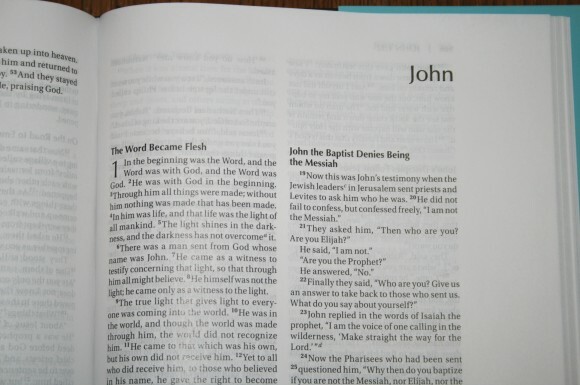 I love wide margin Bibles. I like looking back at notes that I wrote years ago. Sometimes I learn something that I forgot over the years and sometimes I find that I’ve changed my mind about my interpretation. Either way it shows how much I’ve grown and it can be a legacy that I can leave behind. I’m sure she will like this one. 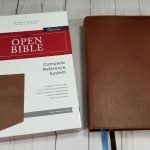 This looks to be a relatively inexpensive bible in a translation lots of people prefer. It is good to see it presented for what it is without it attempting to be something it is not. Some kind of cross reference system should be present though. It is good to see the translators notes as these are useful. I hope every one has a good day of worship. Thank you for your review. It is indeed a fine Bible. The only fine tuning I would make is to print it with a slightly larger typeface or offer it additionally in a large print edition. 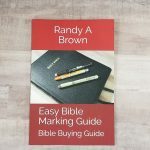 For those of us who are middle age and above, a type size suitable for executives would alleviate easy strain and allow us the study enjoyment of marking in our Bible.